The owner of High Street food chains Cafe Rouge and Bella Italia has posted a sharp increase in losses, as the UK restaurant sector comes under pressure. Casual Dining Group said losses to May 2017 increased 18% to £60m, despite a 2.2% rise in like-for-like sales. It said it had faced challenging conditions "due to consumer confidence levels and the broader impact on discretionary spending". The firm also said it had seen a "significant" rise in costs. The £60m loss included an exceptional cost of £24.4m related to additional financing arranged during the financial year. Total sales for the year were £329m, up 10% due to new site openings and sales growth from existing sites. Casual Dining is one of the UK's largest restaurant groups, employing more than 10,000 people across 300 locations. The group said it had opened seven new UK sites in the past nine months, and planned further expansion, with 17 new international openings scheduled for 2018, as well as further new UK openings and refurbishments. Its chief executive Steve Richards is one of a number of restaurant bosses who have written to the Chancellor Phillip Hammond, ahead of Tuesday's Spring Statement, calling for a dedicated minister to represent the industry and to work on a plan for growth. "Our business, along with many others operating in the hospitality sector up and down the country, is set to be saddled with inflation-busting business rate hikes next month," he said. And he added that "high business rates stifle the sector's growth potential and ability to create more jobs". What's eating the restaurant trade? 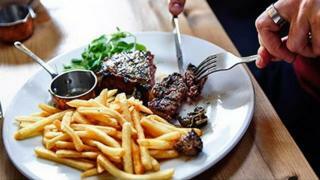 A string of chains including Jamie's Italian and Byron have closed outlets recently amid financial difficulties. Earlier this month pizza chain Prezzo became the latest to cut back, closing 94 outlets. That amounted to about a third of its outlets and included all of its TexMex chain Chimichanga. Barbecoa, a smaller chain also owned by Jamie Oliver, went into administration last month, while Italian chain Carluccio's has called in accountants KPMG to advise on possible strategies to cut costs. What’s eating the restaurant trade?